Developer Compile Heart is seemingly never fully satisfied with any of their mainline Neptunia games. While there is certainly precedent for it regarding the technical and gameplay mess that was the original PS3 Hyperdimension Neptunia title and its significantly improved (and formerly exclusive) Vita remake Hyperdimension Neptunia Re;birth several years after, the necessity of all the remakes afterward becomes murky at best. Contrary to its confusing original name, and even more misleading VR pun, Megadimension Neptunia: VIIR is neither exclusively a VR game nor magically the seventh main entry with a roman numeral styled naming convention (despite how it may feel like so at this point) but rather a remake of Neptunia's fourth mainline entry that debuted on PS4 back in 2016. 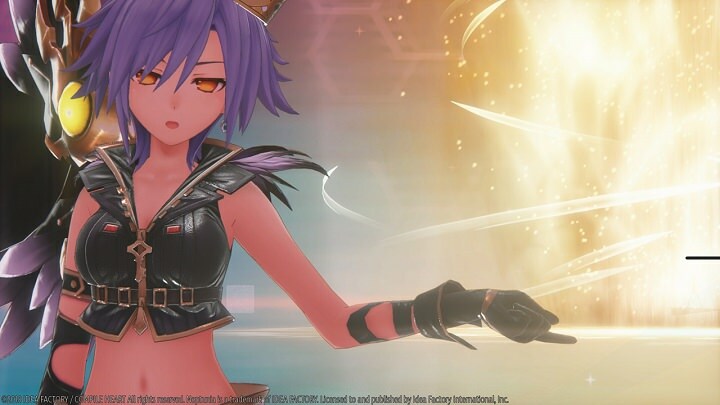 Promising dramatically overhauled gameplay systems, improved visuals, and other fine-tuning, does Megadimension Neptunia VIIR provide a happy ending to one of the series' more divisive entries or should one simply give up daydreaming on the prospect? Weirdly enough, the very first thing one views in the game is actually a VR headset-intended-- but still fully playable without--- series of cutscenes which are completely new to this remake. 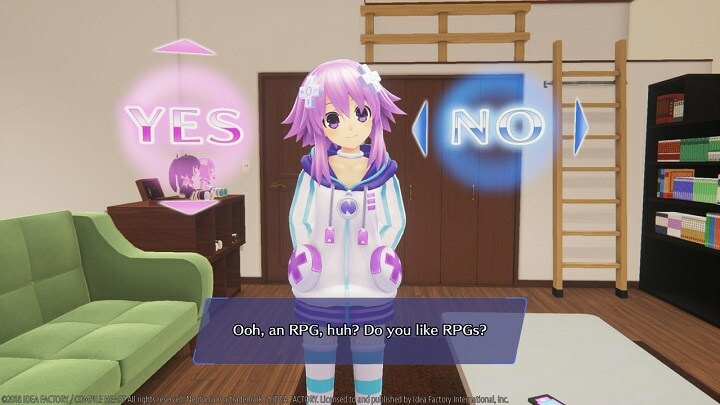 Through this it essentially establishes, in an unapologetic shattering of the fourth wall, that the "player" themselves is able to choose between going through the main role-playing game itself or the much more mundane VR-encouraged features in which you can optionally subjugate yourself to listen to the ramblings of CPU goddesses Neptune, Noire, Blanc, or Vert with the occasional "yes" or "no" affirmations from the player. You can probably guess how much time I spent with the latter... (very little). As for the main RPG itself, it is obviously the most substantial portion of the experience that even breathes a somewhat intriguing change in context with the VR features as the main story progresses. Admittedly, I never played the original version of Megadimension Neptunia VII but reportedly its biggest annoyances were that the gameplay systems were not very intuitive; like an overly complicated combo system in battle or other grating annoyances over time like constant random encounters on the world map. Anyone that played it in its original incarnation may be pleased to hear that neither of these features is a factor this time around in Megadimension Neptunia VIIR. That said, for better or worse, the series is seemingly back to being quite mindless with its more menu-driven battle system, which is also very easy to exploit. I found a very quick routine in abusing the newly added counter abilities (which basically wastes an enemy's entire turn) or spamming strong special moves rather than doing anything particularly strategic or creative regarding its combo mechanics. This is only emphasized further by the main story's cakewalk difficulty and how little effort it requires to be overleveled throughout since normal equipment can have generous experience multipliers applied to them. It is honestly a good thing the difficulty is so breezy (yet for the wrong reasons) considering the aggressive amount of gameplay monotony it has throughout. Everything from bosses to dungeon layouts are recycled constantly throughout and this pretense, unfortunately, goes into hyperdrive during the game's true end in particular. For reference, the final boss is reused twice... and it's basically a palette swap of a boss enemy that is regurgitated nearly five times earlier in the story. Don't get me started on the dungeon recycling that somehow sets a much worse reuse precedent. The series has always had glaring repetition issues but, for some reason, it becomes even more insulting when the main characters themselves point out how tired they become of it. Here's a pro tip about self-aware gameplay humor -- It doesn't work when you handle your own gameplay recycling worse than the games you attempt to poke fun at. Megadimension Neptunia VIIR unsuccessfully tries to disguise this blatant padding in the form of three bizarre, disjointed story arcs. The first story arc is easy enough to follow with a (deserved) emphasis on the newcomer Uzume, however, the storytelling takes an especially weird turn in its second act, which re-contextualizes the world itself. 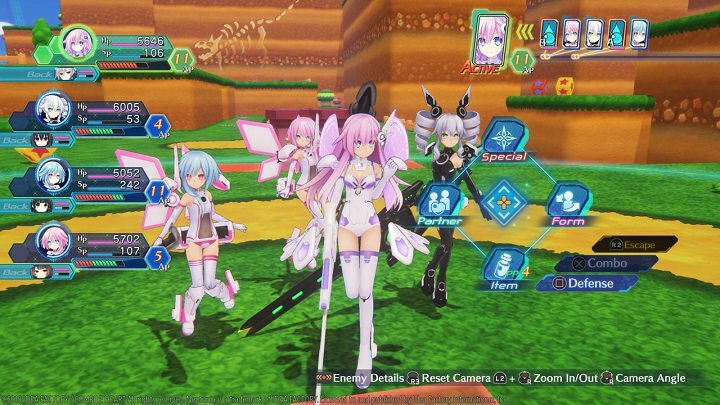 Basically, the player switches between the CPU Goddess leads of Neptune, Noire, Blanc, & Vert; all of whom have self-contained story arcs that focus on eventually confronting the parody characters that represent Square-Enix, Capcom, Bandai, and Konami. While this leads to some occasionally humorous quips in the script, in a gameplay context, however, this means that the goddesses pretty much never have more than one to two party members with them at any one time. As an extension to this problem, the bland reused dungeon treks become much more obvious and the combat system itself comes across as very limited until very late in the third and final story act that finally gives access to its huge playable cast. Even though I would certainly struggle to say the storytelling approaches being anywhere near cohesive, or particularly decent for that matter-- Megadimension Neptunia VIIR's storytelling does manage to be a fair amount more endearing than the sum of its many rough, plodding parts. It mostly achieves this, despite all odds, narrative feat through its approach to characters. Because the storytelling so frequently splits up the party it actually gives individuals who barely justified their existences in prior games, like the CPU Candidates in particular (or little sisters of Neptune, Noire, & Blanc), the surprise opportunity to become much more likable. The several new VR segments also give a formally underutilized character, who is somewhat of an early spoiler, in original VII a more prominent role (despite how vapid many of the early scenes are), which is a nice touch as well. Yet, far and away the biggest character standout is certainly Uzume, who almost feels out of place because of it. 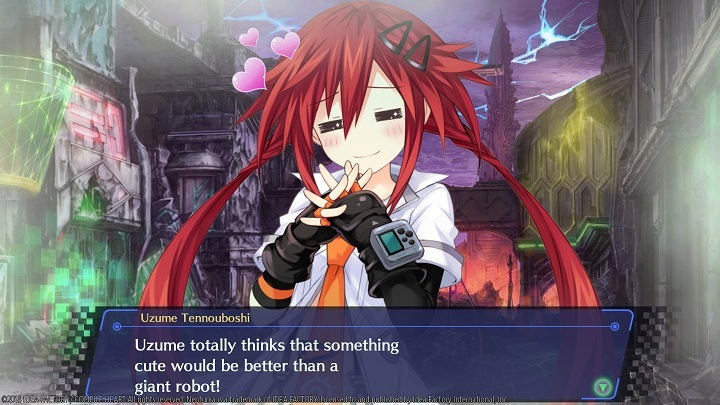 In a series where most of its heroines are defined by their tropes like Neptune and her fourth wall breaking jokes or Noire and her tsundere attitude, Uzume is far more thoughtfully handled as a character who sees a lot of genuine development. Of course, it can be more than difficult to recognize this considering how Megadimension Neptunia VIIR not only has several shallow "fanservice" bathing scenes but an incredibly obnoxious amount of breast size jokes throughout which makes it more than safe to say the writing frequently misses its mark for humor in spite of some earnest attempts at character development it sneaks in every now and then. Megadimension Neptunia VIIR seems to struggle giving much incentive to long-standing fans or even newcomers to really try it out. It is an enhanced release that had the misplaced focus of streamlining certain gameplay and cosmetic rough edges rather than taking a stern look at fundamentally fixes the core game itself, especially story-wise. Though there are glimpses of fairly earnest character moments sprinkled about, the majority of the time the player is left with an incredibly subpar RPG that tries to poke fun at its genre contemporaries without either the wit or the understanding as to what makes them actually good to earn it. Frankly, with so many better Japanese RPGs that have appeared since 2016, Megadimension Neptunia VIIR feels that much more stuck in the past and tough to justify paying attention to it at all, no matter one how many dimensions it claims to have warped between. - Why are there so many re-skinned enemies/bosses and recycled dungeon motifs throughout?! I'm surprised this series is still going on, honestly! I feel like there are plenty of other RPG series people could go to instead of rehashing something like this. Sad to see that the ratings have been plummeting too. Never know when a random entry in a series is going to break the mold.